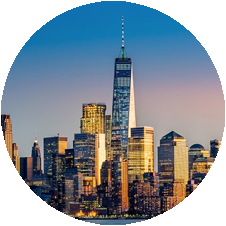 New York, NY is a part of the Logistics Plus® network. This office provides LTL and truckload brokerage, air and ocean freight forwarding, warehousing and distribution, project cargo, import/export, and global trade compliance services. New York City comprises five boroughs sitting where the Hudson River meets the Atlantic Ocean. At its core is Manhattan, a densely populated borough that’s among the world’s major commercial, financial and cultural centers. Its iconic sites include skyscrapers such as the Empire State Building and sprawling Central Park. Broadway theater is staged in neon-lit Times Square. New York is also home to a Logistics Plus office where we proudly serve both small and large businesses throughout the region. If you’re located in New York City, or any other surrounding areas, your friends at Logistics Plus are ready to provide you with local, domestic, and global transportation and logistics services. Additionally, we’ll show you how our people put the “plus” in Logistics Plus by doing the big things properly, and the countless little things, that together ensure complete customer satisfaction and success!